Get the best profit-driving strategies and tactics in distribution from this series of books by Randy MacLean. Drawing on decades of first-hand business success, and with insights gained from companies dominating their sectors, Randy has collected the wisdom of hundreds of top executives to share with you. Customer service is not only an important function for every company, it can be a powerful tool to drive cash-flow, profits and growth. And not just for the obvious reasons. 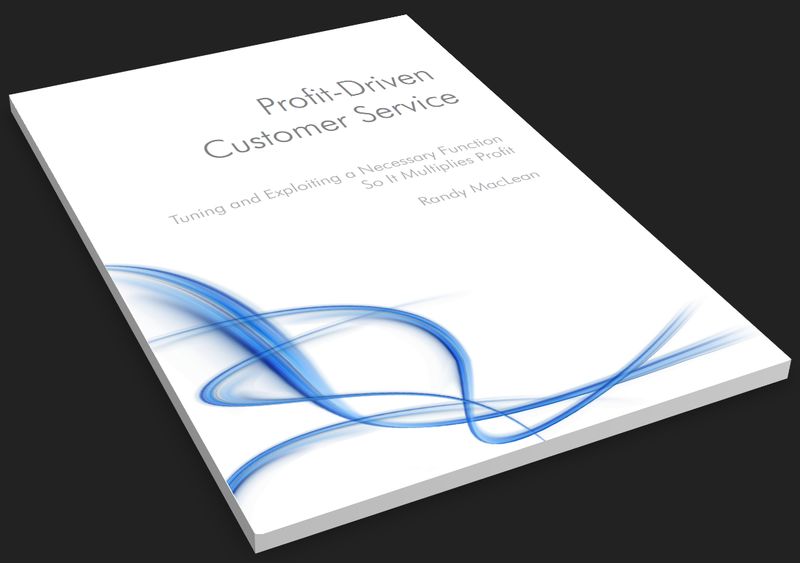 In this book, Randy MacLean shows how a sophisticated approach to the structure and deployment of a two-tier customer service capability can significantly accelerate a company’s growth and market share, and multiply profit rates. The new approach supports and magnifies the unseen profit dynamics that drive the economics of every business. The result of a decade of advanced analytical work and insights from the world’s most profitable companies, this surprising approach can put any company into a leadership position while delivering world-class customer service. The book features an inventory of policies and techniques every executive will want when they’re planning, training and implementing a world-class concierge customer service group. In this book, Randy MacLean lays out the best new strategy for using cost and profit numbers to optimize a company’s customer base and market position. Using this sophisticated seven-step strategy, any company can move to quickly increase its profits, cash-flow, and market share. Competitors will be helpless to prevent lost profit-performance and lost market position, and may never recover. Using deep profit analysis, Randy shows how companies actually make and lose money (it’s not what you think), and the numbers prove that any company can simultaneously provide lowest price, a superior customer experience, AND achieve industry-leading profit rates. Using this blueprint, companies are emerging out of the pack to outperform their markets, their industries, and their own histories. They’re becoming the new class of acquisitors, expanding their markets and buying up their competitors. Every business executive should have this book, and needs to be adopting a strategy ideal for the rapidly-changing environment and increasingly data-driven environment of the new millennium. This book is a discussion of how new costing and profit analytics are used to produce stellar profit gains. It’s a collection of the most useful and important techniques leaders and owners of wholesale or distribution companies can use to build profits and cash flow. The new technology of Line Item Profit Analytics (LIPA) opens new doors for executives and managers to directly measure and control the profit generated in every increment of their businesses. Combined with Quantum Profit Management – the system of strategies and tactics driven by the information profit analytics reveals – companies have produced record earnings and industry-leading growth. For the first time, it’s literally possible to make money on every single activity in a business. This gives companies the opportunity to dominate their markets in ways that have never been possible. With dozens of examples of advanced profit reports, the book illustrates how analytics are used to translate information into action that produces stellar profit gains. This book is not a course on creating analytics – it’s a course on what to do with them to get fast, significant, and sustainable results. An easy read, the book documents the best of this knowledge so that you can employ it in your quest for extraordinary profit gains. This book is completely focused on the single most effective sales compensation plan yet devised – profit-driven commissions. A good sales compensation plan isn’t just a mechanism to calculate pay, it’s most importantly a device to price sales activities to produce a given profit. For a plan to deliver, it must begin with an understanding of the desired end state. The book begins with an eye-opening discussion of the actual (and little-known) dynamics of profit production, and develops a strategy for controlling and directing them. This critical groundwork guides the tactics the profit-driven plan will support. The book finishes with a design walk-through, where the author develops a plan for a company in the most challenging of environments – low profit with a too-large sales force. The reader gets to look over the shoulder of an experienced expert as a plan comes together. Included is a sophisticated workbook for readers to create their own plans. Much more than a recitation of general wisdom and guidelines, this book looks into the base mechanics of profit generation, and the tools employed to help maximize it.